On Monday, September 21st 2015, the Oakland City Council held a special hearing on the health and safety impacts of coal exports out of the Oakland Army Base. According to Oakland City Clerk LaTonda Simmons, 694 individuals signed up to speak, drawing strong support and opposition to the proposed export plan; labor leaders, CEOs, professors, community members, and pastors all arrived to speak on this issue. Ultimately, the debate revolved around "coal versus jobs," with many Oakland community leaders demanding (rightly) that jobs be created for the residents of West Oakland. No coal in Oakland activists, however, want the kind of jobs that maintain a healthy Oakland and planet. The development project itself is not the problem. The problem is the exportation of hazardous fossil fuels. 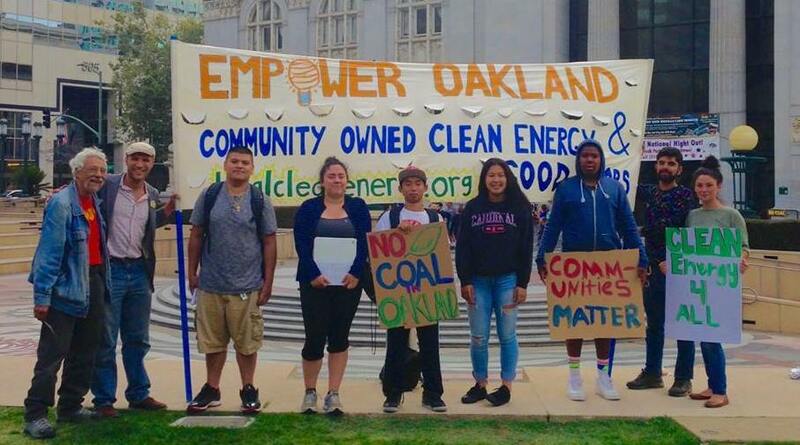 During the hearing, Local Clean Energy Alliance youth leaders rose to deliver powerful speeches against coal shipments out of Oakland. As Pa Dwe of Street Academy, one of the youth leaders pictured in the photo above, declared, "I'm opposed to this coal export because it will make my community in West Oakland sick. I support jobs, but not the kind of jobs that make us sick. There are clean job alternatives, like Community Choice energy, and this will be good for the health of my community. This is my generation now; I want to have a healthy life." Community Choice, as mentioned by Pa Dwe, puts decisions about energy procurement in the hands of a public agency instead of PG&E. This allows for the community to prioritize the development of local renewable energy resources, investing in community-based energy and creating clean energy jobs. Ultimately, councilmember Dan Kalb motioned to keep the hearing on the health and safety impacts of coal open until October 5th. The final decision on whether to permit or ban coal shipments will occur on December 8th.